I still remember my first “real” pair of running shoes. In 2006, I was training for my first half marathon. Until then, I had gotten by with just going to a local department store and grabbing the first pair of shoes I found that looked cool and seemed to fit. But now that I was starting to run longer distances,I figured I should probably take my shoes a little more seriously. So I went to a local running store and got a gait analysis. It turns out that I pronate. This is a fancy way of saying that I put extra weight on the insides of my feet when I run. It’s actually fairly common. Unfortunately, if combined with the wrong shoes, it can lead to injuries. Stability shoes that have padding in the right places to balance out foot movements provide an easy fix for pronation. 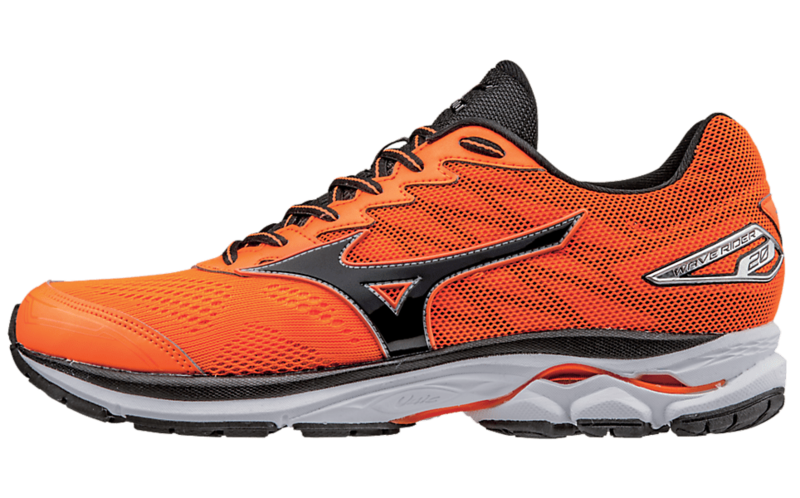 The expert at the running store recommended Mizuno Wave Riders. To this day, I can still remember trying on my first pair of Wave Riders. The thought that immediately popped into my head was: “Heeeeyyyyy, where ya been all my life??”. These shoes somehow managed to provide excellent support while also being so light that I felt like I was running on air. After a quick test run in the running store parking lot, I had to have them. I didn’t even want to take them off. A couple weeks ago, I was happy to receive a complimentary pair of Wave Riders to review. The newest model (Wave Rider 20) seems to be the best one yet. The folks at Mizuno make small improvements to their designs each year. Over the last ten years, these little tweaks have added up to make the Wave Rider 20’s one of the best running shoes I’ve ever worn. My new Wave Riders are lightweight and comfortable. They still have that “running on air” feeling, but still have the right amount of padding in all the right places to give my feet the support they need. They’re also flexible and responsive. It feels like they already “know” what my next foot movement is going to be before I even make it. Lastly, I know that looks don’t have anything to do with the performance and usefulness of a shoe, but I have to say that the new Wave Riders are slick. They’re brightly colored and nicely shaped – the way a running shoe should look. I’ve gotten a number of compliments from people who have seen me running in them. Mizuno also went out of their way to create cool looking shiny silver packaging to celebrate the 20th anniversary of one of their flagship shoes. Great looks and great performance – what else can you ask for, really? If you’re in the market for a new pair of stability shoes, you should definitely give these a look. I’m getting ready to run the New York Marathon in a couple weeks, and I had just enough time between when my shoes arrived and race day to break them in. So now I get to look forward to running the NYC Marathon in my new Wave Rider 20’s. Tim really needs new running shoes. I’ll have to share these with him!! They do look really awesome. He’ll love them! I wore them during the marathon last weekend and they felt great! !